Joyce El-Khoury made her Seattle Opera debut in grand style, replacing an ill Serena Farnocchia with just a couple of days’ notice, and sang her heart out in the title role of Donizetti’s “Maria Stuarda” (“Mary Stuart”) on opening night (February 27) at McCaw Hall. The Canadian-Lebanese soprano was already scheduled to perform the same role at the matinee on the next day, and if she rested her voice, she was a lock to deliver another lights-out performance, a feat that Seattle Opera patrons could remember for a long, long time. 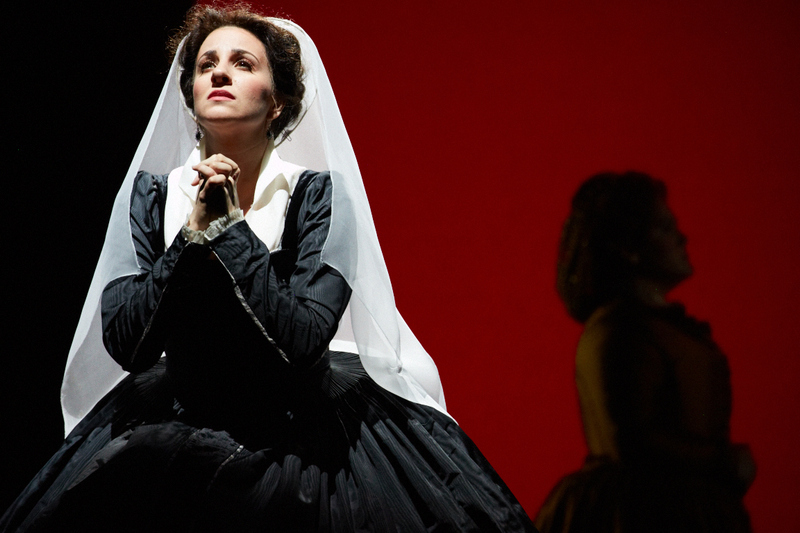 But though El-Khoury made the biggest splash of the evening, she was surrounded by an exceptional cast of principals who collaborated expertly with conductor Carlo Montanaro and director Kevin Newbury (in his SO debut) to put “Maria Stuarda” over the top. 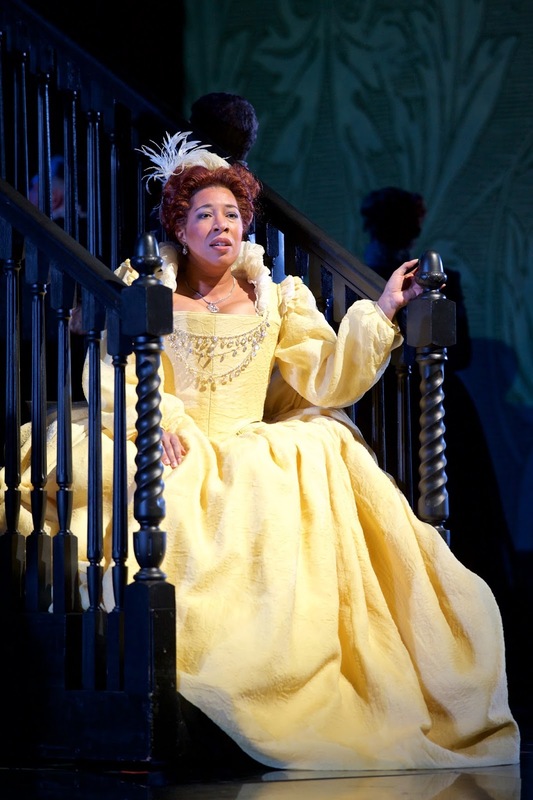 The production, by the way, was the first-ever for Seattle Opera, and the company found just the right touches for this bel canto masterpiece, which was based on a Friedrich Schiller play inspired by Mary Queen of Scots and her cousin Queen Elizabeth I of England. Elizabeth had imprisoned Mary and had her beheaded because of treason and fear of a Catholic uprising against the Protestants. 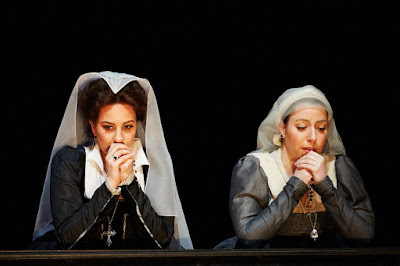 In the opera’s most famous scene, Elizabeth and Mary meet (which did not happen in reality), and that meeting as portrayed by soprano Mary Elizabeth Williams as Queen Elizabeth and El-Khoury as Mary Stuart sent sparks flying all over the stage. The accusatory words “vil bastarda” hurled by Mary at Elizabeth caused some in the audience to gasp. Embodying the passionate yet complex character of Mary, El-Khoury revealed Mary’s tortured soul, highlighted by the confession aria “Quando di luce rosea” and her prayer for forgiveness “Dhe! Tu di un’ umile preghiera.” El-Khoury followed with a stellar “D’un cor che muore” in which Mary asked that Elizabeth be forgiven and topped that with a wildly thrilling high D on the way to her execution while the chorus and orchestra were going full blast. Mary Elizabeth Williams deftly conveyed Elizabeth’s conflicted emotions, applying a soft and alluring voice when trying to seduce Leicester (sung by John Tessier)and switching to a flinty edge when going after Mary. As Leicester, Tessier sang ardently, holding his own against the two fiery divas. Weston Hurt created a wonderfully empathetic Talbot, whose pleas for mercy went by the wayside. Michael Todd Simpson conveyed an unrelentingly upright Cecil whose call to execute Mary firmed up Elizabeth’s resolve to finally sign her death sentence. Renée Rapier’s Hannah was a compassionate and loyal lady-in-waiting. The Seattle Opera Chorus, rehearsed to a T by John Keene, sang with genuine fervor and stamped a seal on the big choral numbers near the end of the Act II just before Mary met her doom. The orchestra, guided by Montanaro, supported the singers with terrific sensitivity, and the entire music effort seemed to fit like a glove. The production used scenery and costumes that were built by Minnesota Opera. While the costumes were traditional, the scenery refreshingly suggested the old and the new. For example, an ornate coffered ceiling evoked traditional palaces but the large columns – outlined with a cross – that descended from the ceiling had a modern flair. For Elizabeth’s scenes, they were bathed in red and for Mary, they were drenched in blue. During the Act II, a huge wall descended from the ceiling, revealing a painting of a woman (Mary) clad in red and ascending heavenward above the outstretched arms of the people. The bare stage floor allowed a large expanse for the chorus to move. Whenever Elizabeth issued a proclamation to her subjects, she climbed a portable and elegant set of stairs. Mary’s set of stairs was just the metal framework, which aptly reflected her imprisoned situation. Newbury’s directions were spot on, including the two girls who pantomimed blissful times in the past when Mary and Elizabeth got along as cousins. Never mind that such times were totally fictitious. Hey, this is opera after all! The Charlotte News and Observer reports a brand-new museum dedicated to tubas will open on March 5th in Durham, North Carolina. The collection, containing 310 tubas (and near relations) belongs to Vincent Simonetti, who was the longtime principal tubist of the North Carolina Symphony. You can also read about the collection at this web site. The collection reminds me of the panoply of tubas that John Richards, former principal tubist of the Oregon Symphony. He had tubas galore, including an original serpent and a couple of ophicleides - all in working condition. How to you figure out which pieces to play for this concert? Stripling: Jeff and I know of the many famous and pivotal performers who appeared at the Cotton Club, and the music that they played there. For example, anything Duke Ellington did, we will pretty much consider for our show – excepting his sacred music and similar pieces. We focus a lot of Duke Ellington’s music because he was so pivotal to the Cotton Club. He would write a different show almost every couple of weeks for the Cotton Club, and you have to realize that his shows involved a big band, dancers, and singers. He was an amazing musician who continues to inspire us today. The dancing at the Cotton Club was very important, and Ellington married one of the Cotton Club dancers. All of the performers at the club were black and all of the audience was white. But they didn’t want the female dancers to be too dark. They used the “paper bag test.” The dancers weren’t supposed to be darker than a paper bag. It was an interesting cultural era. Performances at the Cotton Club started after the Broadway shows closed down for the evening. The Gershwins, Harold Arlen, and many other Tin Pan Alley song writers all went uptown to Harlem to get inspired by a different culture. There’s a great poem by Langston Hughes called “You’ve taken my blues and gone” in which he talks about how others took the blues and put it on Broadway and in movies. It summarized how the black culture of the Cotton Club was so important to other song writers of that period. Our show has the power to show those influences. The one thing we really lean on the high artistic quality of Duke Ellington’s music that we then partner with quality entertainment. This show that we have developed is the second incarnation of this show. Jeff and I had an earlier Cotton Club show that was very successful. We went all over the country with it… including Portland. So the show that we will bring to you this weekend is new version of the show. Did Tyzik arrange everything for you and your trumpet? Stripling: Yes. Every note you hear in the concert was put on paper by Jeff. We figure out what works and with which performers – for this show our vocalist Miche Braden and tap dancer Ted Louis Levy. Jeff works with each of us. He is a real leader – the kind of a guy who makes everything better. I met Jeff when I was in college at the Eastman School of Music. At that time he was playing a lot more trumpet, and he was always a band leader. I think that he has leadership blood in his body. Let’s talk about the music that you will play. Stripling: We will do some Ellington numbers, kicking things off with “It don’t mean a thing if it ain’t got that swing,” and later we will do “Mood Indigo,” and “Harlem Congo.” Another fun tune is “Swing that music,” which was a big hit by Louis Armstrong. What is“Gimmie a Pigfoot and a Bottle of Beer” about? Stripling: “Gimme a Pigfoot and a Bottle of Beer” is a song that Billie Holiday made popular. That is a greasy, gritty song with an urban feel. You couldn’t get that sort of thing in downtown Manhattan. You had to go uptown to Harlem. The blues reflected the feelings of Black people in their everyday lives. So “Gimme a Pigfoot and a Bottle of Beer” gives you that lowdown, gut bucket feeling. That music started in New Orleans and went to Chicago before arriving in New York. By the way, the foundation of Duke Ellington’s music was the blues. “I can’t give you anything but love” was a popular song and jazz standard with music by Jimmy McHugh and lyrics by Dorothy Fields. That song really captured the feeling of The Depression with the idea that I don’t have any money; all I can give you is love. “Smile Darn You” was a song that Sammy Davis Jr. used to do at the Cotton Club when he was a kid. “St. Louis Blues” which closes out the first half was written by W. C. Handy, one of the first guys who wrote down his music. He was able to reap the financial benefit of copyright laws. Before him, other people would hear black music, write it down, and get the credit and the financial benefit. The second half of the program begins with “Swing Out” by Erskine Hawkins, who was a famous trumpeter from the same era. Then we go to “Minnie the Moocher” and “Kickin’ the Gong Around,” which are two Cab Calloway songs. “Minnie the Moocher” is a song about heroin. There’s a lot that has been written up about that and you can easily look it up. “Kickin’ the Gong Around” is also about cocaine or heroin. There was a way of disguising tunes and use inside jokes so that the artist could talk drugs. We’ll play George Gershwin’s “I Got Rhythm,” which filtered into everywhere. The tune is a common progression that many artists used. “Stormy Weather” was performed by Lena Horne at the Cotton Club, and we will honor her with Jeff’s arrangement of that song. “Am I Blue” is a song that Ethel Waters sang at the Cotton Club. Then we’ll do “Ain’t Misbehavin’” another famous Fats Waller number that he performed at the Cotton Club, and we will finish with “Won’t you come home, Bill Bailey” which will almost turn in to a jam session. It’s very spontaneous, and it’s hard to get an orchestra to do that. We tell them that we don’t know when we’re going to finish this song. You just have to watch Tyzik and he will cue you. You don’t have to count any bars, and it ends up being fun for the orchestra. What advice do you have for a young trumpet player who would like to become like you? Stripling: A young, curious mind can take the playlist from the program and just look up the songs on Youtube. Everything is there. You’ll see clips of Louis Armstrong, Dizzy Gillespie, Miles Davis, and lot of other great artists doing these tunes. Anyone can see these videos and find out some of the things that inspired us to do this concert. It was different for me when I grew up. I had to go to the library or buy a record to hear this stuff. Nowadays, with the Internet, people tend to take things for granted. You can open up a whole world. The show that we are doing with the Oregon Symphony is about joy and happiness. And before I forget -- It will feature two amazing talents: vocalist Miche Braden and tap dancer Ted Louis Levey. Both of them will blow you away. On February 26, 1917, the Victor Company issues the earliest known jazz recording featuring the Livery Stable Blues and the Dixieland Jass Band One-Step performed by the Original Dixieland Jass (sic) Band. The mood of the music moved from introverted to extroverted at the Oregon Symphony’s concert on Monday night (February 22), beginning with a sublime selection from Wagner’s “Parsifal” to Sibelius’s inward-looking Sixth Symphony, followed by Bruch’s sweetly expressive Violin Concerto No. 1, and finally the stately pomp of the Prelude to Act 1 of Wagner’s “Meistersinger von Nūrnberg.” Guest conductor Robert Spano and superstar violinist Joshua Bell were the featured artists. While Bell has appeared frequently with the Oregon Symphony over the past several years, the concert marked Spano’s debut with the orchestra. Bell was the big name, of course, and he drew a capacity audience on the third and final evening of concerts with the OSO. He has probably played the Bruch a million times, but that didn’t deter him from pouring every ounce of his musical talent into his performance. His stellar playing featured immaculate runs, sweet legato lines, thrilling high notes, marvelous attacks, and trenchant double-stops. His interpretation was wonderfully nuanced so that each phrase – whether fast or slow, long or short – was never boring. Together with excellent accompaniment from the orchestra under the direction of Spano, Bell’s performance connected so well with the audience that they went bananas and showered him with cheers and applause that brought him back to the stage three or four times. But even if you took Bell out of the programming equation, this was a terrific concert because Spano was at the top of his game, eliciting a superb performance from the orchestra in the three other pieces, starting with the Prelude to Act 1 of “Parsifal.” The opening theme was introduced with great sensitivity by outside line of first violins and the outside line of second violins, and principal trumpeter Jeffrey Work made it glow even brighter. The other themes expanded naturally into the orchestra with the brass choir evoking a polished sound that positively shimmered. You didn’t have to know anything about the themes (leitmotifs) and how they related to the opera, because the orchestra’s performance created the sense of clouds parting and revealing a clear day with gleaming sunshine. Ah! Sibelius’s Sixth Symphony received an intimate performance that touched on all sorts of intriguing subtleties. Lush melodic lines from the strings, playful passages from the woodwinds, and close-hewn phrases form the horns contributed to the optimistic opening in the first movement that then closed enigmatically. The busy second movement gave way to a more deliberate third movement with its loud snappy ending. The fourth featured a bunch of intricate passages in which various sections of the orchestra seemed to exchange phrases. The pillowy landing at the end of the piece cushioned the fading tones, creating a sense of expansive landscape that goes on and on … or just oblivion. Spano waded into the orchestra to recognize the superb contributions of the principal woodwind players: bassoonist Carin Miller Packwood, flutist Alicia Didonato Paulsen, oboist Martin Hébert, and clarinetist Todd Kuhns. Spano guided the orchestra through the Prelude to Act I of “Die Meistersingervon Nūrnberg with a combination of gestures that were never flashy or overstated. The music just seemed to evolve in completely natural way. The amazing brass sound, in particular, was slightly brilliant rather than dusky. The woodwinds had a field day with their perky passages. Even though the orchestra showed flashes of increasing volume, Spano kept it all under wraps until the final measures when he let all of the horses out of the barn. It was just glorious, but it would’ve even been more spectacular if there were ten more violinists sawing away. More violins would have created a better sonic balance. But that is just a nit in an evening of superior-grade music making. The orchestra itself seemed to have the best time ever and concertmaster Sara Kwak led the complimentary statement by not getting out of her chair when Spano shook her hand. He had to bend over and practically haul her into a standing position. Only then did the rest of the orchestra stand. This, in my book, showed how much regard the orchestra had for Spano. Let’s get him back here again pronto pronto!-- And Bell, too, of course! Tidbit from the New York Times obit: In the early 1930s, Shirer and his wife shared a house with the guitarist Andres Segovia. It was on this day in 1940 that Woody Guthrie wrote the lyrics to “This Land Is Your Land." The melody is to an old Baptist hymn. Guthrie wrote the song in response to the grandiose “God Bless America,” written by Irving Berlin and sung by Kate Smith. Guthrie didn’t think that the anthem represented his own or many other Americans’ experience with America. So he wrote a folk song as a response to Irving Berlin’s “God Bless America,” a song that was often accompanied by an orchestra. At first, Guthrie titled his own song “God Blessed America” — past tense. Later, he changed the title to “This Land Is Your Land,” which is the first line of the song. How's this for something different: on Thursday (February 25th) the PSU Symphony, under the direction of Ken Selden, will perform works by Gustav Mahler, Sergei Rachmaninov, and Frank Zappa at the Crystal Ballroom. The Mahler will feature baritone Harry Baechtel and one of the Rachmaninov pieces will put the spotlight on Saelin Ho, who won Portland State University's concerto competition. The doors will open at 6:30 pm and the show will start at 7:30. Tickets are $15 in advance, $20 on day of show (students and seniors: $10 advance, $15 day of show. (Click here to purchase.) Sound intriguing? I talked with Selden to find out more. Is this the orchestra's first performance in the Crystal Ballroom? Why choose this venue? Selden: Yes! This is our first time there, and as far as I can tell, it's the first time in their hundred year history that anyone has performed a program of symphonic repertoire. I've been at PSU for ten years now, and I've brought the orchestra to practically every church and concert hall in Portland; I thought this year we could do something totally different. I'm definitely one of those people who think that the average classical concert experience can be rather uptight (!) so it's a great chance for people to go with their friends and family, enjoy some beer, relax and listen to great music. How many members are in the orchestra? I'm wondering how you are going to fit everyone on the stage - the Rachmaninov will have a piano on the stage and Mahler typically requires large forces. Tell us about the program and how these pieces fit together? Or do they have to fit together? Perhaps in this venue, nothing has to fit together. Selden: That's an interesting question, James. I think it's great to have a program that ties together unexpected material - and I really love putting together repertoire that brings people together. You get Mahler fans and Rachmaninov piano concerto fans together in a room with Zappa fans, and everyone ends up experiencing and appreciating new things. Rachmaninov and Mahler are both considered late Romantics, but they are so different in terms of their treatment of the orchestra and of their approach to harmony and expression. Zappa of course has that avant-garde element mixed with his rock background; what people don't necessarily know is that he was also a composer of tremendous lyricism! What Zappa [pieces are you performing? Are they arrangements?] I didn't know that Zappa wrote any orchestral music. Heck, how did you find this piece? Selden: There's a great Zappa piece called "Music for Low Budget Symphony Orchestra." It's not very well known, except maybe for hard-core Zappa fans. How perfect is that for a university orchestra!? Zappa recorded and performed several versions of it and you can find them pretty easily, for example on Youtube. We're sort of doing our own version, and one of the things that my students found refreshing was that it turns out to be an unexpectedly wistful and thoughtful piece of music. We're also going to play orchestral covers of two songs: "America Drinks and Goes Home" and "Mother People." We made a decision to play instrumental versions without drums or singers mainly in order to explore his harmonic style and to hear those melodies from a new perspective. "America Drinks," for example, is a parody of popular American love songs, but the actual compositional material is incredibly beautiful. And the huge surprise in "Mother People" is that there is actually a lovely waltz right in the middle of it, when the lyrics say, "Do you think that my pants are too tight?" His sense of humor was always pretty devastating. Tells us about Saelin Ho. Is she a PSU student? Selden: Yes, she's a PSU student, or rather, a recent graduate, I guess. She's an incredibly gifted and talented musician and she was the graduate teaching assistant for the opera area, which means she accompanied all the singers in their preparation and rehearsals for the PSU opera productions. Saelin won the PSU Concerto Competition two years ago, but at the time she was swamped with her opera accompanying activities and we couldn't schedule a performance of her concerto. And then I was on sabbatical, so we are now finally having a chance to perform. She's going to perform the first movement of the Second Piano Concerto, which is probably Rachmaninov's most famous piece. This is a very powerful work, but what I think is quite interesting in Saelin's approach is that she brings out the poetic qualities that I don't think we often hear in performances of this piece. To me, it's a very effective interpretation, and it allows us to hear a familiar piece in new ways. By the way, I should mentioned that Portland Piano Company is sponsoring our event, so we'll have a really great Steinway piano. We are also performing one more Rachmaninov piece, the "Adagio" from the Second Symphony, which is another of his great lyrical masterpieces. What should we know about Harry Baechtel? I found his bio on the web, and it looks like he is a Mahler specialist. Selden: Yes, that's right. Harry joined the PSU faculty last year and he's doing an amazing job with our voice students. In addition to teaching voice, he's also a historian; in fact he's currently teaching a class on Mahler! It's great for the students to see that kind of versatility - to take his class and then hear him perform. Interestingly, from my perspective as a conductor, what I admire and value most about his singing is that his approach is absolutely intelligent, thoughtful and deeply heartfelt. I mean, I don't want to generalize, but how often do we use those kinds of words to describe singers!! Mahler wrote his own lyrics for "Songs of a Wayfarer," about a young man whose sweetheart is getting married - but of course to someone else! and by the end of the last song, he goes to sleep under a Linden tree, so there's that connection to Schubert's "Winterreise," for example. It's a pretty amazing song cycle and the students are really enjoying the experience of getting to work on it. Will there be a mosh pit for the Zappa? Selden: Ha ha! I'm just getting started on my Zappa cycle, so those songs that inspire a mosh pit will have to wait for the next time! A standing-room-only crowd greeted the Vancouver Symphony on Saturday afternoon (February 20) at the Skyview Auditorium. You could practically feel the buzz in the air, because the featured artist was Thomas Lauderdale, the well-known leader of the hybrid lounge band Pink Martini. He took center stage to play George Gershwin’s “Rhapsody in Blue” as part of an all-American program that included works of Aaron Copland. Fortunately for Lauderdale, he has a dynamic, charismatic personality that communicates very effectively with the audience, and that personal showmanship carried the day in his playing of Gershwin’s beloved classic, which was a good thing, because his pianism was often off course. By that I mean that Lauderdale missed notes, executed several sloppy runs, and rushed the tempo a few times. He did do well with passages that were slower, and played loud enough to be heard over the orchestra. But despite his errors, the packed house absolutely embraced his performance and rewarded him with a standing ovation. The enthusiastic applause brought him back to the stage a couple of times, and he responded with a lovely rendition of Gershwin’s “The man I love” in an arrangement for piano. The orchestra, under music director Salvador Brotons, opened the concert with Gershwin’s “Porgy and Bess” in the popular orchestral arrangement by Robert Russell Bennett. The lush strings at the beginning strains of “Summertime” caused the entire hall to erupt with smiles and good times rolled onward with the jaunty “I Got Plenty O’ Nuttin,’” “Oh I Can’t Sit Down,” and “It Ain’t Necessarily So.” A willowy segue by principal cellist Dieter Ratzlaf nicely landed the ensemble in a sultry rendition of “Bess You is My Woman” and the finale “O Lawd I’m On My Way” struck a wonderfully grand tone. After intermission, Brotons led the ensemble in a sensitive interpretation of Copland’s “Appalachian Spring” Suite. Highlights of the performance included marvelous solos by concertmaster Eva Richey, principal flutist Rachel Rencher, principal oboist Karen Strand, and principal clarinetist Igor Shakhman. It should be noted that Shakhman also nailed the wonderfully wild opening statement in “Rhapsody in Blue” and, that piece, principal trombonist Greg Scholl created some of the best wa-wa sounds that I have heard anywhere. For the final piece on the program, the orchestra took listeners south of the border with another Copland piece, “En Salon Mexico.” The folksy dance tunes received colorful performances that made this piece fun to hear. The sleepy trumpet of principal Bruce Dunn helped to evoke the tipsy dance band segment. Principal bassoonist Margaret McShea had a field day with her solos as did Shakhman. The percussion battery had a fine day as well, but they should’ve hit the bass drum more emphatically. The Eugene Register-Guard has reported that the 2016-2017 will be the final one for conductor Danail Rachev with the Eugene Symphony. Rachev is in the second contract with the orchestra, and it expires in June of 2017. According to the Executive Director Scott Freck Rachev's exit is pretty standard for the orchestra, because the three previous conductors - Giancarlo Guerrero, Miguel Harth-Bedoya, and Marin Alsop - stayed for six or seven years before moving on. When Claire Chase finished her hour-long performance on Friday night (February 19), she left most of the audience at Zoomtopia gasping for breath and probably wondering what that was all about. They had just witnessed a performance art/sonic exploration that started in high gear and blasted off – climaxing with a volcanic piece in which Chase (sans flute) recited streams of words while prancing into, around, and about the audience. 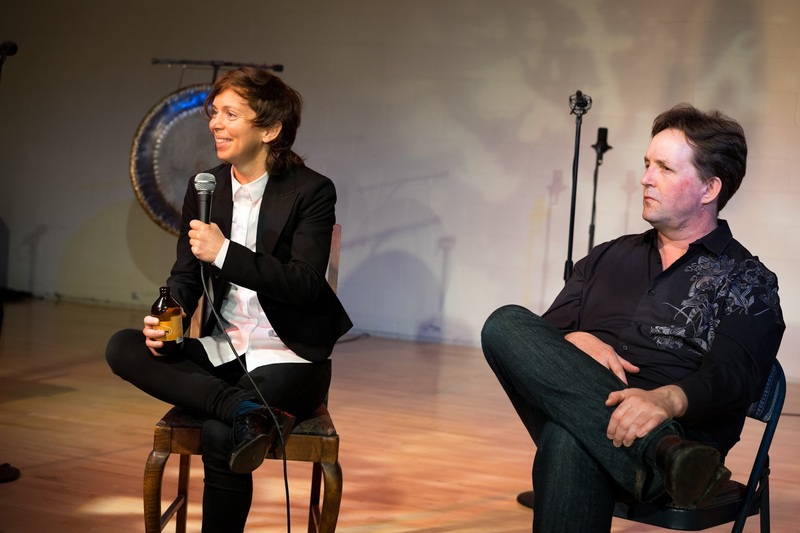 It was a riveting, wide-ranging sonic exploration by the New York City-based, MacArthur Fellow. 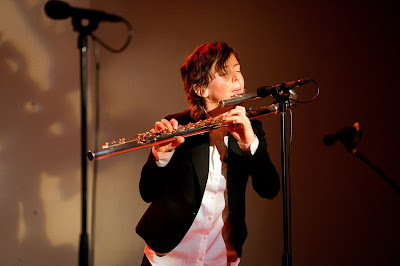 The one-woman flutist extravaganza was sponsored by the Third Angle New Music Ensemble as part of its Studio Series, and the Friday show was the second of two that Chase performed. The concert began with Edgard Varése’s “Density 21.5,” which is considered the first solo flute piece that pushed the artist and the instrument into new territories. Wearing blue, workmen’s overalls, Chase began the piece while standing on an 8 foot ladder. She wasn’t on the top rung of the ladder, but the persuasive, intense way that she played conveyed the sense of someone committed to take the plunge from a great height. She would fire off a series of tones and cut off each with a demonstrative swing with her flute. The next pieces, all written last year by composers commissioned by Chase, flowed together with barely a break in the action. Dia Fujikura’s “Lila” featured Chase playing the flute, the bass flute, and the contrabass flute. I had never seen a bass flute before, and it is impressively big – sort of trombone-sized – but it was nowhere near as large as the contrabassoon, which was more tuba-sized – but without all the curling tubing and the big bell. In any case, Chase rocked-out on those instruments: singing into the mouthpiece, talking, overblowing, underblowing, buzzing, tonguing, and a bunch other techniques that I didn’t grasp. Things got more complicated with Francesca Verunelli’s “The Famous Box Trick” and Nathan Davis’s “Limn” because they incorporated electronic sounds. I heard whistling, grunting, groaning, growling, panting, muffled sounds, rapping or tapping. Often the sounded were layered on top of each other. At times, the sound reached into an elemental, animalistic arena that fluctuated between being oddly appealing and repulsive. At one point, Chase was on her knees; then minutes later she was playing the flute on back while stretched out on the floor, or she played while on a skateboard. I think that she could play upside down, if she wanted to. The sheer variety of unusual sounds led up to Pauline Oliveros’s “Intensity 20.15: Grace Chase” in which Chase put her flutes aside and did an extended word play in a unique duet with a computer-controlled sound interface called the Expanded Instrument System. Oliveros designed the EIS, which works by picking up sounds from the microphone worn by Chase. Those sounds were fed to processing modules in a computer and then emitted from speakers in the performance space. So we heard the text that Chase recited and the generated tones from the EIS – which was manipulated by Levy Lorenzo. Speaking of text, the words that Chase spoke were written by her grandmother, Grace Chase, who apparently wrote something every day of her life. The text rhymed at times, but mostly seemed nonsensical so that we stopped trying to make sense of what Chase said but rather just appreciated the musicality of it all. That was teamed up with her antic interaction with the audience: taking someone’s shoes or handbag and clowning around. The intensity was electrifying but disconcerting at times because it seemed that Chase might have a meltdown or just go insane right in front of us. But she didn’t. And it was gratifying to stay after the show and hear her answer questions from the audience with pluck, intelligence, and emotional understanding. Wow! The first issue of The New Yorker was published on this date in 1925. The magazine was founded by Harold Ross and his wife, Jane Grant, who was a reporter for the New York Times; Ross remained editor in chief until his death in 1951. The magazine was styled as a showcase for wit, gossip, and culture; its target readership was the New York sophisticate. As Ross said, “[I]t is not edited for the old lady in Dubuque.” The problem was that the magazine lacked a clear vision at first. In the second issue, editors published an apology for the first: “There didn’t seem to be much indication of purpose and we felt sort of naked in our apparent aimlessness.” Circulation had dropped to 12,000 by fall, but then it started to turn around; its recovery was helped along when Ross hired E.B. White as a staff writer in 1926, and brought James Thurber on board the following year. Gradually, the magazine stopped dropping names and began building a reputation as the home of outstanding contemporary poetry, short fiction, and essays. On this day in 1848, the most influential and best-selling political pamphlet of all time was first published: The Communist Manifesto, written by Karl Marx and Friedrich Engels. Marx and Engels wrote the Manifesto as a call to action aimed at proletariat across Western Europe, and as an advertisement or plug for a specific type of socialism — the version Marx and his colleagues and the Communist League promoted. There were a lot of versions of socialism already circulating around Europe. Most of the ideas that went into the Communist Manifesto were brainstormed over the course of a week and a half in a room above an English pub — a pub called the Red Lion, located in the Soho district of London. Karl Marx had the job of drafting the ideas into something publishable. He was supposed to get it done by New Year’s Day, but he missed his deadline. He finished it, along with help from Engels, by early February — and it was on this day in 1848 that the pamphlet was finally published. It was on this day in 1872 that the Metropolitan Museum of Art opened to the public in Manhattan. Its first home was rented space at 681 Fifth Avenue, in a building that had started off as a house and been remodeled by Allen Dodworth to serve as a dance academy. Among the founders of the museum were its first president, John Taylor Johnston, a wealthy railroad tycoon who headed up the fundraising; and William T. Blodgett, who paid $116,000 to buy three collections of Flemish and Dutch paintings, and then turned them over to the museum. Blodgett was in Europe during the grand opening of the Metropolitan Museum of Art. On February 22nd, Johnston sent Blodgett a letter about the openings — to the press and artists the evening of the 19th, and to the public on the 20th: "Personally I felt very apprehensive of the effect of inviting the disaffected artist element and the gentlemen of the Press, but it all worked very well. One party who came there with an artist told me afterwards that they halted for a moment before going in in front of the building, and the artist told him it was a 'd----d humbug, and' added he, 'I thought so too, but when we came out we thought very differently.' Our public reception on the 20th was an equal success. We had a fine turnout of ladies and gentlemen and all were highly pleased. The pictures looked splendid, and compliments were so plenty and strong that I was afraid the mouths of the Trustees would become chronically and permanently fixed in a broad grin." The museum moved several times, eventually leasing land from the city on the east side of Central Park and building a permanent home there. The Metropolitan Museum of Art is now more than 2 million square feet and contains more than 2 million works of art. According to this report from King5, Seattle Opera has plans to demolish Mercer Arena and build a new facility for operations. Mercer Arena is located next to McCaw Hall. Operas would continue to be held at McCaw. The cost for the project is estimated at $60 million. Demolition of Mercer Arena should be completed by January on next year, and the new facility is scheduled to be finished sometime in 2018. Seattle Opera's operations currently is based in the South Lake Union area. It was on this day in 1904 that Giacomo Puccini's Madama Butterfly premiered in Milan, Italy, at Teatro alla Scala. Puccini had first been introduced to the story while he was in London for the premiere of his opera Tosca. There, he saw a one-act play called Madame Butterfly, written by the American playwright David Belasco. Belasco had based his play on a short story of the same name by John Luther Long, who claimed it was a true story told to him by relatives who were missionaries in Japan. Long was probably lying, though, because his story was very similar to a French novel called Madame Chrysanthème (1887) by Pierre Loti. Even though Puccini had only a basic command of English, he was sure that Belasco's play had the makings of an opera. He wrote to his friend and publisher, Giulio Ricardo: "The more I think of Butterfly the more irresistibly am I attracted. Oh, if only I had it here, that I might set to work on it! I think instead of one act I could make two quite long ones: the first in North America and the second in Japan." He worked on the opera for four years, trying to improve on Belasco's plot and pacing, and consulting frequently with the wife of the Japanese ambassador for advice on names, music, and characters. In November of 1902, he wrote to Giulio: "The action must move forward to the close without interruption, rapid, effective, terrible! In arranging the opera in three acts I was making for certain disaster. You will see, dear Signor Giulio, that I am right." So on this night the opera debuted, in two acts. Earlier in the day he wrote to his leading lady, the soprano Rosina Storchio: "My good wishes are superfluous! So true, so delicate, so moving is your great art that the public must succumb to it. And I hope that through you I am speeding to victory. Tonight then — with sure confidence and much affection, dear child." But opening night was a disaster. The public hissed and yelled at the actors. Rosina Storchio was so distressed that she announced she would never sing the role of Butterfly again. Madama Butterfly closed after just one night, and Puccini wrote to Storchio: "And so, my Butterfly, the love-sick maiden, would leave me. You seem in your departure to be taking away the best, the most poetical part of my work. I think that Butterfly without Rosina Storchio becomes a thing without soul. What a shame! After so many anxious fears, after pouring out such riches of your keen and delicate intelligence, to receive the reward of brutality. What a disgrace it was! But I am sure that this horrible impression will soon be wiped out of our minds, and so, with warm affection and confidence in the future, I wish you good luck." He spent the next few months rewriting the opera — he even changed his mind, again, and gave the opera three acts. It reopened at the Teatro Grande in Brescia on May 28th, 1904, with a new Butterfly, the Ukrainian soprano Salomea Kruszelnicka — otherwise, the cast was the same. This time, it was a huge success, with multiple encores, and Puccini was called on stage 10 times. Last Saturday in Lincoln Hall, members of fEARnoMUSIC performed an outstanding concert to celebrate their newly released CD, “Somewhere I have never traveled.” The album and the concert featured the music of Bonnie Miksch, who is the chair of the music department at Portland State University. Each piece on the program took the audience on a sonic journey that was often meditative and introspective, exploring relationships and dream states. All of the pieces were recorded for the CD at Kaul Auditorium by David Hoerz during the summer of 2015. The concert began with “Song of Sanshin,” in which Miksch took a traditional Korean tune and shaped it to a new path. Tones slipped and slid gently between notes as if drawing out an elongated curlicue. A thoughtful phrase would float into view and sometimes become slightly rhapsodic with intriguing embellishments. Throughout the piece, violinist Paloma Griffin Hébert, cellist Nancy Ives and pianist Jeffrey Payne maintained a superb balance of sound – as if in the same contemplative state. Next came “Somewhere like you, my darling,” which had a beguilingly intimate and intertwined feel. That duet was commissioned by violist Joël Belgique for his wife violinist Inés Voglar Belgique, and the two played the piece with a mind-meld that took the music to a higher level. The lovely interplay of sounds between the two performers was as much fun to hear as well as watch – a signature piece, for sure. With “Man dreaming butterfly dreaming man,” Miksch was inspired by a legendary Taoist philosopher, who dreamt of becoming a butterfly and then upon awaking wondered if he were a butterfly who then dreamt of becoming a man. With violinist Voglar Belgique and pianist Payne, the piece quickly put listeners in the realm of the fluttering butterfly. If so, then perhaps the low and slowly churning notes were supposed to represent man. Or perhaps that didn’t matter at all, because one could become spellbound by the unusual sounds that Voglar Belgique created. After intermission the six of the core members of the fEARnoMUSIC ensemble (Voglar Belgique, Griffin Hébert, Belgique, Ives, Payne, and percussionist Joel Bluestone) played “Somewhere I have never traveled,” a five movement work that probed dream states – or as the composer stated in the program notes: the non-physical realm. The first movement, “In a state of vibration,” established light and pleasantly reassuring base. That immediately gave way in the second movement, “Dweller at the threshold,” which took over with a heavy, ominous and nightmarish, edgy atmosphere. The third movement, “In a body of blue stars” evoked a sense of weightless drifting about with random-like notes from the piano and sustained tones from a bowed xylophone. The fourth, “Sexploration,” undulated with a rhythmic pulse, a wonderful marimba line, and south of the border quality. The fifth, “In a field of golden light,” sounded lithe and opened like a flower so that the music seemed to ascend and coalesce before it ended. 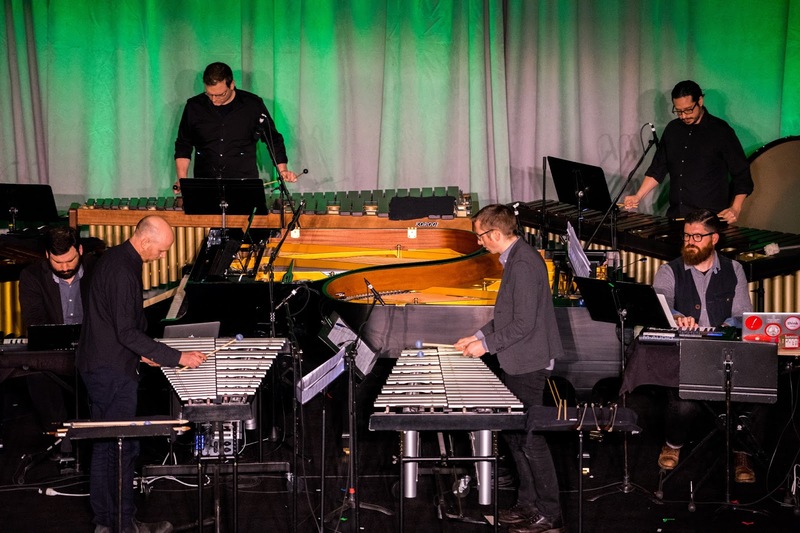 Throughout “Somewhere I have never traveled,” Bluestone showed his expertise on a variety of percussive instruments, including a series of small cymbals, two big gongs, tubular bells, xylophone, and marimba. The performance was the last one that Bluestone, who was one of the founding members of fEARnoMUSIC, would give with the ensemble. Congratulations are in order for violinist Augustin Hadelich and the Seattle Symphony under Ludovic Morlot for winning the Best Classical Instrumental Solo (category 78) at the Grammy Awards for their recording of Dutilleux's "L'arbre des songes." The Boston Symphony under Andris Nelsons won the Best Orchestral Performance (category 74) for their performance of Shostakovitch's Symphony No. 10. That beat out both the Seattle Symphony's Dutilleux recording and the Oregon Symphony's "Spirit of the American Range" recording as well as the Pittsburgh Symphony's recording of Bruckner's Symphony No. 4 and the New Zealand Symphony's recording Symphony 'Humen 1839' by Zhou Long and Chen Yi. American composer and Pulitzer Prize winner Steven Stucky has died in Ithaca, NY. He was 66 years old. Here is an obituary from BBC Music Magazine. According to Alex Ross in The Rest is Noise: "Michael Cooper, of the New York Times, reports that the cause was brain cancer." This Saturday evening the fEARnoMUSIC ensemble will present a concert in celebration of their new recording of works by Oregon composer Bonnie Miksch. 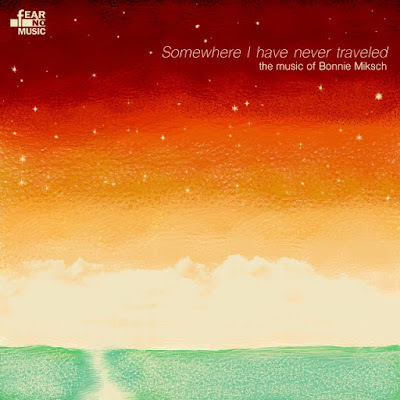 Entitled “Somewhere I have never traveled,” the concert and the CD feature Miksch’s chamber music, which is an exploration of states of consciousness, emotions, memories, and dreams. The concert and CD release event will take place at 7:30 in Room 75 of Lincoln Hall on February 13th. The cost for tickets $5-20. Where did you study music composition? Miksch: I went to Syracuse for my undergrad degree and to University of Cincinnati for my Masters and Doctorate. All of my degrees are in music composition. Miksch: I grew up near Pittsburgh, Pennsylvania, which had a terrific arts scene. I had never been to Portland until I interviewed for the position at Portland State, but my dad was from Portland and went to Lincoln High School in the same building that is now where my office is at PSU. My parents fostered creativity in our household. We were encouraged to write plays and make up songs and poems. My mom kept us busy with the arts. I started with the piano in second grade and violin in the fourth. Dad was an engineer and mom a nurse. Were you always interested in composing music? While an undergrad, I took my first composition class. The anxiety that I felt as a performer kind of dissipated when I took composition. Truth be told, I didn’t enjoy all of the hours practicing scales and arpeggios and concerto excerpts. I got bitten by the composition bug and had a real wonderful mentor, Andrew Waggoner who still teaching at Syracuse. Melinda Wagner, who won the Pulitzer Prize for music in 1999, was my theory teacher at Syracuse. I really loved school and taking as many classes as possible. This new album has my acoustical music. I live in both worlds. Miksch: The title reflects the music on the disc which explores dreams and different states of consciousness. It’s more about internal travel in a dreamworld. I’ve been inspired by dreams for years and how to work with them creatively. It’s an internal experience, but a shared experience with everyone – the personal in the context of the community. There are four pieces altogether. The commission from the fEARnoMUSIC was to have a piece for their core: string quartet, percussion, and piano. It’s difficult for them to find pieces in the repertoire that has all those elements. It’s over 20 minutes long and has five movements. Each movement is based on a dream image. The other pieces feature subsets of the core. I’ve got a piece for violin and piano that is an older piece. It has been performed a lot. It’s called “Man dreaming butterfly dreaming man.” It’s based on the Taoist philosopher who had a dream that he was a butterfly and then woke up wondering if he were a butterfly dreaming that he was a man. That’s the idea of lucid dreaming. The violin is detuned one whole step on the E string. That changes the color of the piece and gives you some interesting harmonics. One of the pieces on the album is called “Song of Sanshin.” I wrote it after the Korean Cultural Society put a call out for composers to create some music based on some Korean themes that they had posted. So I wrote a piano trio using one of those theme, and that was a lot of fun. It spoke to my heart, and I won an honorable mention. Sanshin was a mountain god and the music that I wrote has a solitary aspect. Congratulations again, and good luck with your composing! Jeannine B. Cowles, a major, major supporter of opera in Portland, passed away on February 4th at age 87. Click here for her obituary in The Oregonian. The Oregon Symphony showcased its own prodigious talent, as well as that of guest pianist Natasha Paremski on Saturday night at the Arlene Schnitzer Concert Hall. The evening consisted of a short work by Stravinsky, a delicious set of jazzy pieces for piano and orchestra by Paul Schoenfield, and Gustav Holst's magnum opus The Planets. Maestro Carlos Kalmar joked about the short works the symphony typically opens with as being 'parking overtures,' but also alluded to the desire to showcase shorter works of great importance, and Stravinsky's Fireworks was no exception. Flashy, brilliant and brief, it served as an appetizer for the challenging Schoenfield to come. Schoenfield's Four Parables for Piano and Orchestra was a fascinating undertaking. Opening with Rambling Till the Butcher Cuts us Down, it was aptly moody and sinister to start. Sinuous winds followed by an exploding piano, elephantine shrieks from the horns and intense, rapid syncopated rhythms combined to form a jazz danse macabre. Paremski demonstrated tremendous power, a necessary prerequisite for staging this difficult work. She showed speed, agility, and frankly a bit of daring, fortunately so because massive amounts of all were needed. The second parable, Erlking, began with a walking electric bass line underlying fascinating little vignettes from various instruments, as though one were looking at, or listening to the world through warped but not unkindly lenses. Paremski hammered and sighed through a stride-style piano segment like a bacchanalian lounge player, pulsing with demoniac energy. The final movements, Elegy and Dog Heaven must have required every bit of stamina and fortitude the brilliant Paremski had to offer: the incredible tremolando passages, thundering glissandi and titanic scalar motives whirling in rapid succession were like hot jazz fusion from the center of a star. The second half consisted entirely of Holst's signature work, The Planets. Hearing it live is a vivid reminder of why this work is so beloved (and so imitated), and the Oregon Symphony is an ensemble perfectly capable of delivering every bit of wonder this work has to offer. Opening with maybe one of the most famous fanfares in all the repertoire, the brass were magisterial and the strings brimming with menacing pomp for Mars, Bringer of War. And what a relaxing and placid refuge was Venus, following Mars. Mercury the Winged Messenger was full of delicate twittering strings and nuanced texturing; no one was phoning in this chestnut. Kalmar kept it lively and vibrant, and the orchestra was right there with him. Though not programmatic per se, one couldn't help but envision the jovial Jupiter striding through the spheres like some smiling behemoth. The mysterious harbinger of doom Saturn...one could feel the footsteps of inevitability, one's own demise approaching. The mystery of the final movements, Uranus and Neptune, between the warm and intimate caress of the violins and the ghostly women's choir...the OSO and guests Women of Portland State Chamber Choir and Vox Femina are a stunning reminder of why live music is so tremendously important, and how the experience so impossible to replicate in any other medium. Record growth marks the 120th Anniversary Season with a 20 percent increase in the number of classical concerts, a new multimedia series in collaboration with artistic luminaries, two commissioned world premieres, and 16 Oregon Symphony premieres. Music Director Carlos Kalmar and President Scott Showalter have announced the details of the Company’s 2016/17 season. Titled “Like Never Before,” the season, which celebrates the Company’s 120th Anniversary and builds on the records-shattering success of the past two seasons, marks a new era of artistic growth and community collaboration. Armed with another Grammy Award nomination, its third in four years, the Symphony creates new artistic experiences in a signature series titled SoundSights, in which visual art is merged with orchestral sound. In each of the three installments in this series, the Symphony collaborates with some of the Northwest region’s most prominent artists. Renowned artist Dale Chihuly’s works of art provide the setting for the production of Bartók’s Bluebeard’s Castle; Pacific Northwest College of Art’s acclaimed animator Rose Bond and her team project dramatic video around the interior walls of the Arlene Schnitzer Concert Hall for Messiaen’s Turangalîla-Symphony; and production design wizard Michael Curry transforms the stage for Stravinsky’s Perséphone. SoundSights concerts headline a Classical subscription series that grows from 40 performances to 48 performances, a 20% increase over previous seasons. 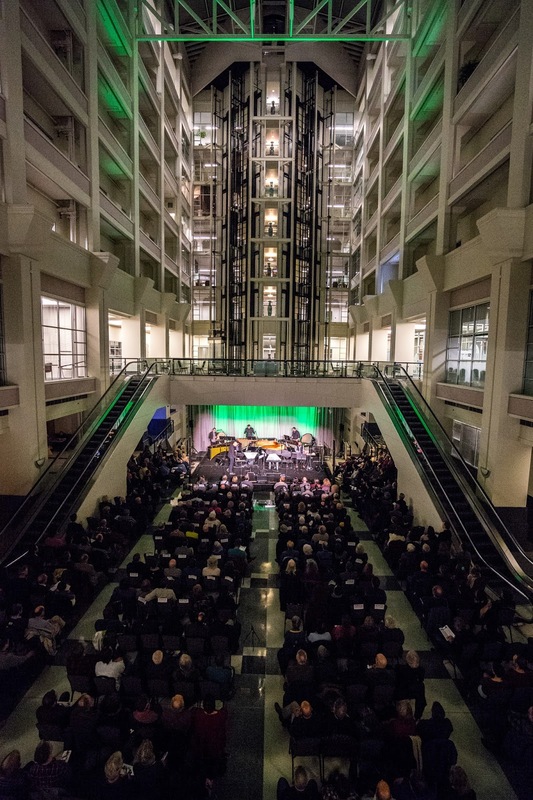 That growth allows all classical programs to have three performances—on Saturdays, Sundays, and Mondays—providing patrons with more choices and opportunities. In addition to that classical performance growth, all subscription packages expand to include eight classical performances, half of the season’s classical offerings. Monday classical concert start times move from 8:00 pm to 7:30 pm, aligning the start times of all evening concerts. The 2016/17 120th Anniversary Season, which opens on September 10, 2016 and closes on May 22, 2017, includes 48 performances of 16 Classical subscription concerts, 8 performances of 4 Pops subscription concerts and 3 performances of 3 Kids subscription concerts, for a total of 59 performances of 23 different subscription concerts. In addition to the subscription concerts, the season includes three renowned classical performers in Special Concerts: Soprano Renée Fleming kicks off the season on September 10; violinist Nadja Salerno-Sonnenberg performs and conducts Vivaldi’s Four Seasons on January 7, 2017; and violinist Gil Shaham joins the orchestra on April 2, 2017. Every season, the Oregon Symphony performs between 20 and 30 concerts beyond its subscription series. These Special Concerts—under the Oregon Symphony Presents banner—span a wide range of genres. Patrons can expect the full slate of these Special Concerts to be announced in May. The buzz in the air at Montgomery Park on Saturday evening (January 30) reflected the high level of anticipation from an overflow crowd, some of whom were patiently waiting to buy an unclaimed ticket from will call. They were looking forward a Third Angle New Music Ensemble concert devoted to the music of Steve Reich. The program, “aptly entitled Reich-analia,” featured two classic Reich pieces: “Sextet” and “Drumming” both of which explore intoxicating sonic possibilities from percussive instruments. 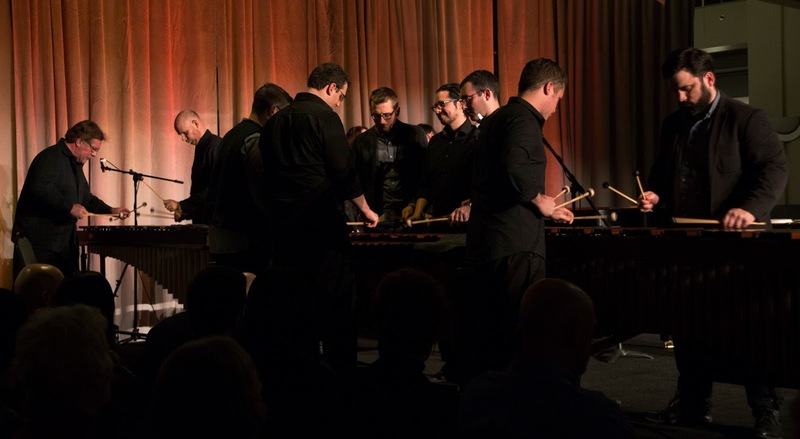 The featured virtuosos of the performance were Sō Percussion, a New York City based percussion ensemble that consists of Eric Cha-Beach, Josh Quillen, Adam Siliwinski, and Jason Treuting. They partnered brilliantly with several other superb musicians to elevate the propulsive, minimalist music of Reich. Because he uses repetitive rhythmic patterns so ingeniously, Reich’s music has a hypnotic quality, and that was evident right away with “Sextet” (1985), which featured Sō Percussion plus Oregon Symphony percussionists Sergio Carreno and Jonathan Greeney. Seemingly simple patterns evolved and devolved from an array of instruments that included keyboards, marimbas, vibraphones, bass drums, crotales, and tam-tams. Bows used on vibraphones created longer, more sustained tones that reminded me of a gentle fog horn. The overall tonal shape of the piece seemed to dip slightly and then rise on an upswing. Rhythmic patterns had a uniform quality that dissolved into a random-like style before syncing up again. The only glitch in the performance was a speaker that was turned on a few minutes after things got started. The sudden increase in sound briefly jarred people’s ears, but the artistry of the performers easily eclipsed that snafu, and they received an overwhelmingly enthusiastic applause from the audience at the end of the piece. In the second half of the program, sticks and mallets teamed up with voices and piccolo to give a trance-inducing performance of “Drumming” (1971). Members of Sō Percussion created a virtual thicket of rhythmic patterns that ricocheted off the walls. Sometimes one drummer would take over for another to give him a much needed break. Players would turn the end of their sticks around to use either the wooden end for a slightly sharper sound or the mallet end for a slightly softer sound. Somewhere along the way Carreno and Greeney got into the action on the marimbas, and later moved over to the glockenspiels. In the midst of all this, they were joined by Christ Whyte and Oregon Symphony colleagues Niel DePonte and Michael Roberts. Percussive vocals from Katherine FitzGibbon and Beth Meyers phased in and out of the soundscape but they were difficult to hear over the continuous pummeling. The same problem occurred when Sarah Tiedemann played her piccolo. Still, the musicians created an array of overtones that sounded otherworldly. 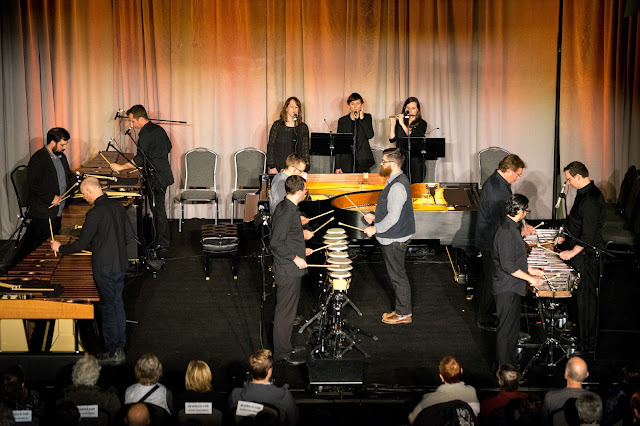 Intriguing pattern-changes and incredibly speedy stickwork were also part of the hour-long sonic mixture, and the virtuosic effort of the ensemble was rewarded with a standing ovation. I have to admit that I felt a brief wooziness when I stood up. Perhaps that was due to the vibratory level of the performance. But as I left the performance area, I noticed that one of the audience members had fallen and that EMTs were already in the building with a stretcher. It probably had nothing to do with the concert, but I could understand if that person stood up a little too quickly, he/she might have simply passed out. Weird things can happen at concerts. I've experienced an audience member throwing up on me during a concert. Such is the power of music - or the true feelings toward music critics! Chamber Music Northwest (CMNW), one of America's top chamber music festivals, is pleased to announce its 2016 Summer Festival. June 25-July 31,2016. Under the direction of acclaimed clarinetist David Shifrin, the five-week festival will be one of the most ambitious, entertaining, and expansive chamber music festivals ever presented in the Northwest. Exploring Beethoven. his influence and inspiration in over fifty concerts over its five week run. It will bring to Portland some of the world's most renowned chamber music artists and ensembles, highly acclaimed local artists, and the rising stars of classical music's next generation. CMNW's Summer Festival is unlike any other music experience available in our region, presenting over 100 acclaimed artists and ensembles in over 50 concerts at Reed College's Kaul Auditorium, Portland State University's Lincoln Hall, and other venues throughout the Portland area. In all, they will perform more than 100 chamber works, ranging from Beethoven's complete string quartets and beloved classics by Mozart and Brahms to new and contemporary works by composers of today. CMNW's unique, collaborative environment is prized by the visiting musicians, allowing international artists like the Emerson String Quartet, Melvin Chen, and Jennifer Frautschi to collaborate with other world-class and rising star musicians in the beauty of a Portland summer. 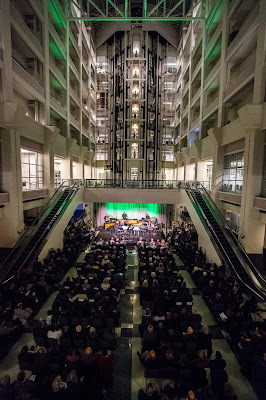 The festival also allows Northwest audiences the opportunity to hear the world's leading musicians play the world's greatest music in a fun, dress-down atmosphere that includes casual summer picnics on the picturesque grounds of the colleges, informal open rehearsals, educational opportunities, and three free community concerts. "At the core of the 2016 Summer Festival is the entire cycle of Beethoven string quartets performed by five great American quartets," says Artistic Director David Shifrin. "Beethoven's quartets represent not only the core essence of the chamber music repertory, but one of the crowning achievements of human civilization." The inspiration for this ambitious festival came from the Emerson String Quartet's three­ concert series pairing Haydn's late opus 76 quartets with Beethoven's early opus 18 quartets. While these incredible works form the heart of the festival, it includes much, much more. This year's festival will feature several incredible collaborations. CMNW is again working with Tango for Musicians at Reed College, the Oregon Bach Festival, and BodyVox. Working with Tango for Musicians CMNW will present their opening night concert featuring world-renowned tango musicians performing with CMNW festival favorite Peter Wiley. 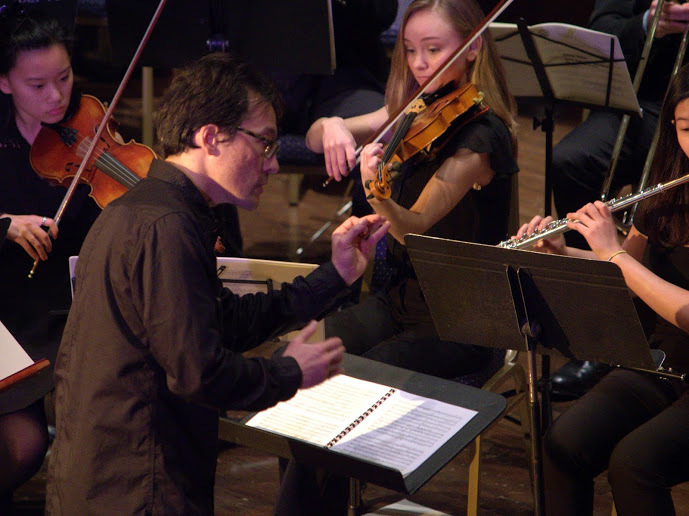 The Oregon Bach Festival will present two concerts as part of CMNW's festival featuring pianist and scholar Robert Levin, once performing with the Berwick Academy Chamber Orchestra and once with the Festival's faculty. CMNW and BodyVox will present Death and Delight, a multi-performance event featuring chamber music and dance themed around Shakespeare's Romeo and Juliet and A Midsummer Night's Dream. This summer is New@Noon,- now featuring five concerts- is back! The groundbreaking concert series explores the diversity and depth of contemporary classical music. These concerts, as well as informal composer lunches, a family concert, three community concerts, and the premieres of four new works commissioned by CMNW, will allow audiences to become more familiar with the chamber music of the present and future. CMNW is thrilled to bring over a dozen Protege Artists- rising stars of classical music- to Portland this summer. These incredible young artists will be featured in eight concerts bringing a fresh sound to classic chamber pieces. Executive Director Peter Bilotta notes, "We are thrilled that our 2016 Summer Festival will bring us back together again with the Oregon Bach Festival, Reed College's internationally renowned Tango for Musicians conference, and BodyVox. And, we're very excited be able to expand our New@Noon concerts and our Wednesday night concerts to five performances each. It's going to be an incredible five weeks of music." CMNW in a celebration of contemporary tango. Ida Kavafian, Steven Tenenbom, and Peter Wiley perform an all-trio concert featuring Haydn, Beethoven, and Mozart. Beethoven and Mozart on period instruments. The Orion String Quartet performs string quartets by Beethoven and Mendelssohn. Join Protege Project artists as they perform Op. 95, Op. g6, and Op. 97 from the end of Beethoven's middle period. Let yourself be carried away by the Orion String Quartet in this concert of works composed late in life featuring Schubert's "Death and the Maiden." The Emerson String Quartet joins CMNW for three concerts lauding Beethoven's innovation and inspiration. Keyboard concertos from J. S. Bach, Stravinsky, and Mozart will light up the stage. Celebrate the music of Scandinavia with works by Nielsen and Portland composer David Schiff's new arrangement of Grieg's Peer Gynt Suite. Join us for this exciting world premiere theatrical experience chronicling the last years of Brahms's life and the unlikely source of his musical inspiration! The Mir6 Quartet is joined by David Shifrin, Andre Watts, and Sasha Cooke in the final concert performance of the 2016 Summer Festival.